With the holidays and all of it's doings, there wasn't much time to read. But the two books I did finish were SO good, I need to share. I discovered Beatriz Williams last year, and this is my favorite book of hers so far. It's got love and intrigue and a little historical fiction thrown in. Several nights I stayed up way too late because I couldn't put it down. And then there's Amy Krouse Rosenthal's book. If her name sounds familiar, you might remember her piece in The New York Times called You May Want To Marry My Husband. Last year as Amy was dying of cancer at the age of 51, she wrote this beautiful essay. Go read it, and then get this book. It was written many years before her diagnosis, and I've never read anything like it. It's clever and creative and tons of fun. The world lost a truly talented, unique author when she passed away last March. I've set a few concrete goals for this year, which I'll get around to sharing eventually. 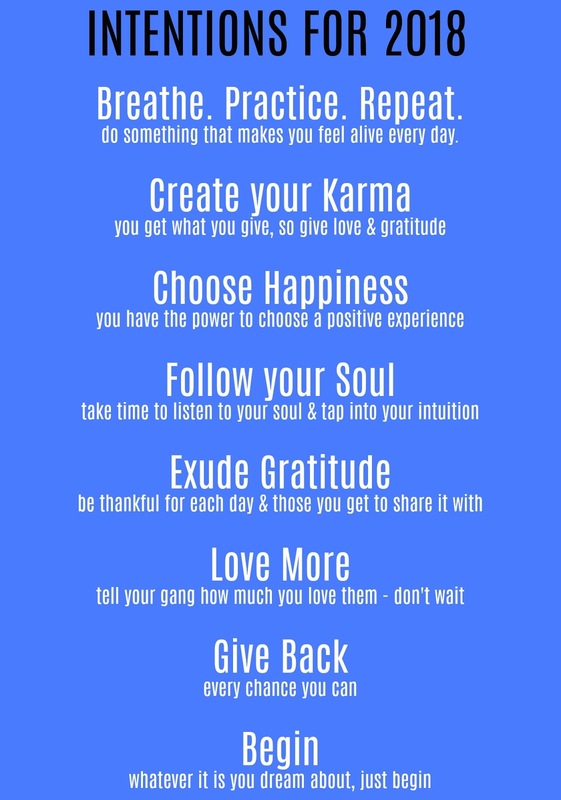 I also love the idea of intentions as goals. Or just a way to live every single day, right? Speaking of 2018, I took one of those Facebook quiz thingy's that pop up, and apparently my word for the year is "Alchemy". Which I found interesting, because one of my favorite books of all time is The Alchemist. It means "any seemingly magical process of transforming or combining elements into something new". I definitely feel like it's time for me to become something new, so maybe it really is my word. A few weeks ago, my cousin invited me to go wedding dress shopping with her. 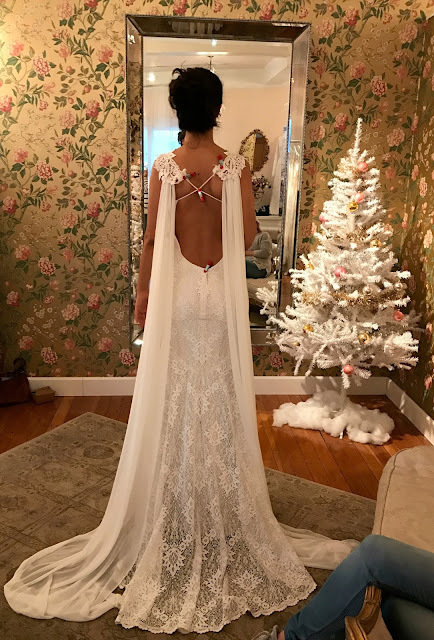 This made me so happy because a) I love wedding dresses and have kicked around the idea for years of opening a shop and b) I worry that I'll never get this experience with my own kids, because I have boys, and what if their fiance's don't like me? Anyway, can I just say that the dresses of today are SO stunning? I mean, I love my dress from 27 years ago, but it can't compare with the gorgeousness my cousin tried on. Since you can't see her face, I'm sure she won't mind if I share this picture... And yes, that's a chiffon cape on the back and I was swooning. Watch: the second season of "Better Late Than Never" is on, and I highly recommend. Henry Winkler, William Shatner, Terry Bradshaw & George Foreman travelling the world and having hilarious adventures. My boys call it the old geezer show, but it's hysterical and heartwarming and will make you happy, I promise. Do not watch: Downsizing, the new Matt Damon movie. It started out promising, and then went down the most bizarre path that made absolutely no sense. 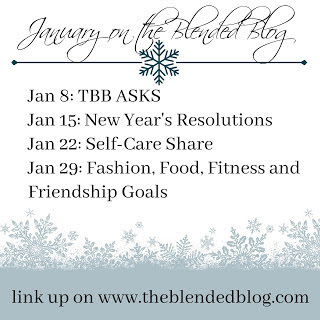 The Blended Blog has some great Monday prompts this month, and I hope you'll join us. 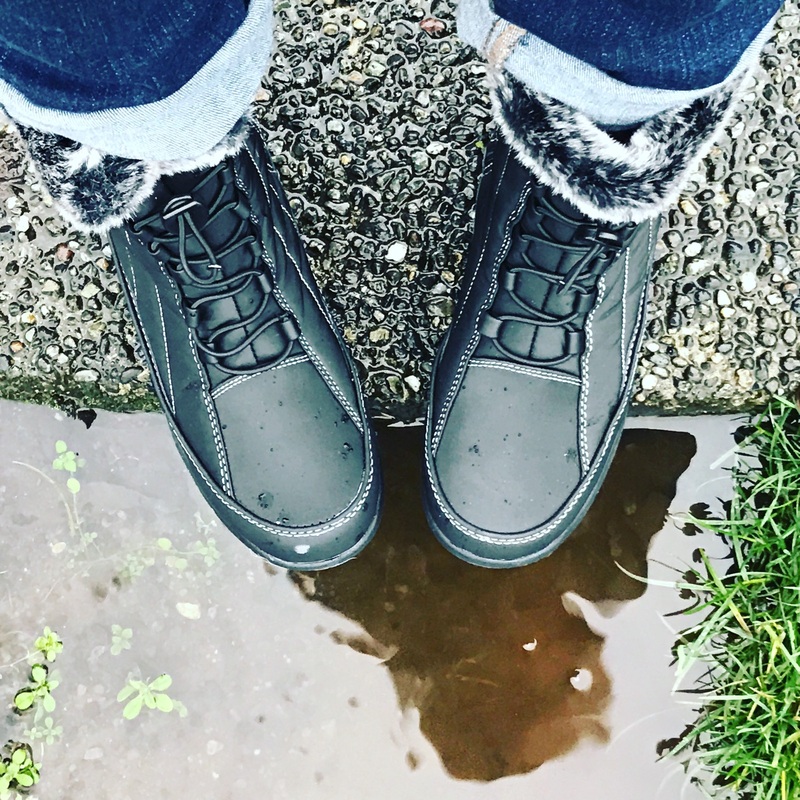 This coming Monday we're talking about resolutions, and I'll be sharing where I do and don't want to go with le blog this year. 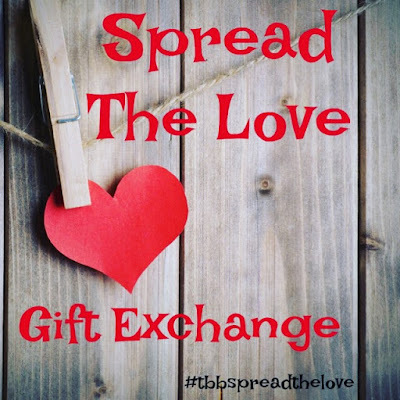 And there's still time to sign up for our Share The Love gift exchange. Go here to fill out the google form and find all the details. Okay, my rambling is done. Have a great weekend! Oh Lana, I too am swooning over this dress and what a dream it would be to have a shop...Yep I always say what if the girl's they marry don't like me but sweet friend how can they not LOVE YOU!! Happy weekend! You're sweet! I hope they love us! Wow! wedding dresses sure don't look like I remember them anymore. I'm going to look for Better Late Than Never. I prefer watching something funny. They're so pretty - but expensive! Please keep writing Friday posts. 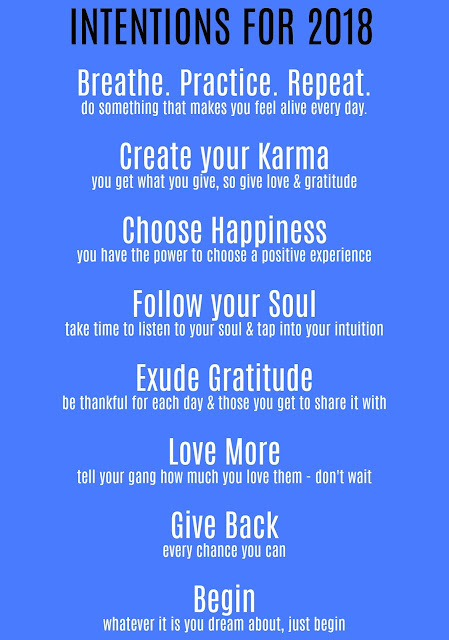 I really enjoyed this and posts like it with just thoughts and information. I agree - wedding dresses these days are beautifully designed! Thanks friend. I really enjoyed writing this - just random things that popped into my head! Of course you should continue to post on Fridays! I don't pay attention to blog statistics because I just feel like my blog is my space, it's my words, my life and if someone doesn't want to read it, I'm fine with that. I absolutely could NOT finish Violet Grant! I had 15% of it left and I just shut the book. And I hate when I don't finish a book! Hope you have a great weekend! Stay warm! Thank you! Why couldn't you finish the book? Have a great weekend! Isn't it beautiful! And it might not even be the one - she's deciding between 3 and they're all gorgeous. Have a great weekend! I'm going to look into that better late than never. I hope it's on Netflix. Beautiful wedding dress. A bit Catherine I think. Yes, it's very classic! I don't know if the show is on Netflix - it's NBC so? Gorgeous Dress!!! Adding your books to my list!! 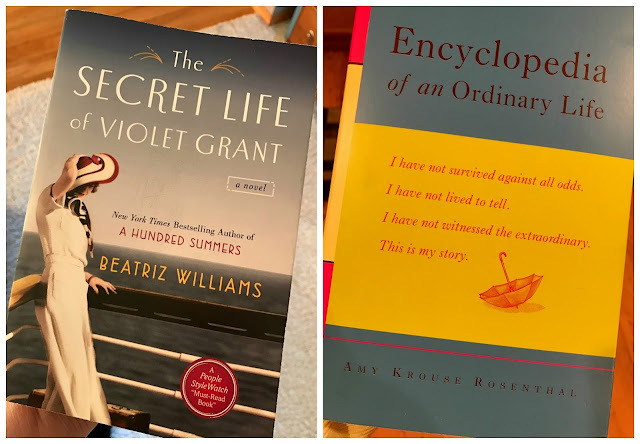 I just hear about Violet Grant and I've never read anything by Williams! And I am a huge fan of Better Late than Never!! HILARIOUS!!! Have a great weekend Lana!! Isn't it funny? That show makes me so happy. Happy weekend Katie! Oh man, Amy Krouse Rosenthal was amazing! As a school counselor I am so familiar with her fascinating work and her essay last year was chill worthy - what an inspiration! I need to read this book. What an incredible life. Ok, I have boys too and I'm guessing they're not gonna marry girls who don't like me just like yours won't. Even though we've never met I can tell how special your relationship is with your family and trust me that makes a huge difference. All that being said I know the groom's mother will never be the bride's mother so I feel ya friend. We'll shop for gowns and enjoy while we can with whom we can! That dress is gorgeous btw. I wanted to see the Matt Damon movie but my husband said it looks like a rental, lol. He's always better about picking movies, I am notorious for picking the bad ones! Hi Lana... Thanks for giving me the heads up on the Amy Rosenthal book as well as "better late than never." Love the Intentions poster. Enjoy your weekend! I love new book recommends! Thanks for the Beatriz Williams recommendation! She sounds like an author I would be in to! Did she say yes to that dress??? I hope so. Fridays are such slow traffic days but that's my day I post my own stuff so I always have to do it! Low traffic or not.